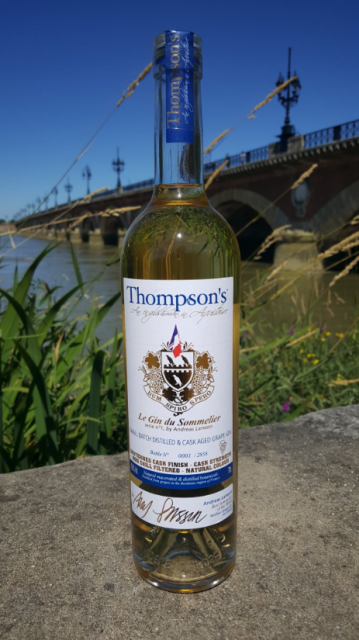 Bordeaux’s Thompson’s Spirits has launched a limited edition, cask strength, grape-based gin, aged in Sauternes barrels from Château Labouade, in partnership with Swedish sommelier Andreas Larsson. The gin, bottled at 42.6% ABV, has been produced in a limited batch of 2,858 bottles. Having been aged in ex-Sauternes barrels from Château Labouade, the base gin is made with 15 botanicals including caviar and peaches. The rest of the botanicals include juniper, lemon peel, sweet orange, vanilla, rosebuds, coriander, Jamaican pepper, cinnamon, ginger, cubeb pepper, green cardamom, quassia amara and angelica. Inspired by the tradition of making eaux-de-vie in the French winemaking regions, Englishman Simon Thompson, founder of Thompson’s Spirits, double distills Ugni Blanc, Colombard and Sémillion grapes to make the base spirit for his range of gins, vodka and cask-aged eaux-de-vie. The gin is expected to retail for roughly €48.50 per 70cl. Larsson commented: “I am proud to present this Sommelier’s Gin, conceived and elaborated with my friend Simon Thompson and finished in ex-Sauternes casks from Château Labouade. With an elegant and intense flavour, with a lush texture and complex botanical spiciness it brings originality and depth as a sipping gin, on your top shelf for cocktails or in my favourite G&T”.